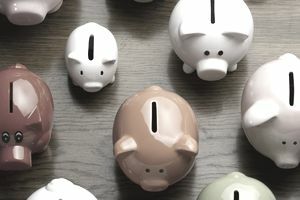 It is common to receive advice to put money into savings, but many people do not know where to go from there. It is important the money you are saving has a specific purpose because then you can find the best way to make that money grow and to begin building wealth. Before you become focused on saving money, you should get out of debt, since the interest rates on credit cards, and most other loans and higher than on typical savings accounts. Setting up a support system that focuses on your financial goals will help you become better at saving money. First, you should work on saving 15% of your income towards retirement. You can build up to this gradually, through pay raises, but 15% will help you to retire comfortably. Contribute up to your employer's match into your 401(k), and then you can max out a Roth IRA for the rest. If you still have more to contribute go back to your 401(k). Your contributions will add up over time. When you are younger, you will want to choose more aggressive investment options for your retirement accounts, but you will need to switch those into more conservative options as you get closer to retirement. As you are increasing the amount you contribute to retirement, you should be saving up an emergency fund of six month's to a year's worth of expenses. This should be put into a money market savings account or a Certificate of Deposit if the rate is high enough. Since this money is your emergency fund it should be easy to access if you need it. Your emergency fund should be used for serious financial events such as losing a job. You should create a budget that will set aside money for home and car repairs. If you are self-employed or a single income household, it is better to have closer to year's worth of expenses saved. This will give you more of a cushion if you were to be laid off. After you have your emergency fund then you should begin saving for other goals. If you do not have a house yet, you should save up money for a down payment on a home. You can also save for a new car, or for your vacations. By saving up for these purchases, you will save money on interest and free up more of your income so you can do what you want. You can track how much you have in each savings category so you know when you've reached your goals. The priorities for these goals should really depend on your personal situation and where you are in your life. If you want to buy a new house in the next few years, then that should take priority. If you are getting married soon, then saving for your honeymoon may come first. It is a good idea to save up for most of your major expenses whether it is a home remodel or a dream vacation. If you are interested in building wealth, you can put additional money aside each month and begin to invest it in the stock market. When investing in the stock market it is important to realize it is for the long term. Mutual funds are the easiest way to invest because they spread the risk over several different stocks. Many brokerage firms allow you to purchase mutual funds without a high initial investment if you are willing to do automatic contributions each month. Look for funds with a good growth history. As you work to build wealth, it is important to have goals in mind for this money too. It may be retiring early, being able to help your children through college or a second vacation home. You may want to leave a good inheritance to your children. Each individual will have slightly different priorities, but no matter what those priorities are retirement and your emergency fund will come first. After that, you can focus on your other goals and building wealth. It can help to have a solid plan put in front of you. Once you determine your priorities, you can create a chart or excel sheet that lets you track your progress on your goals.